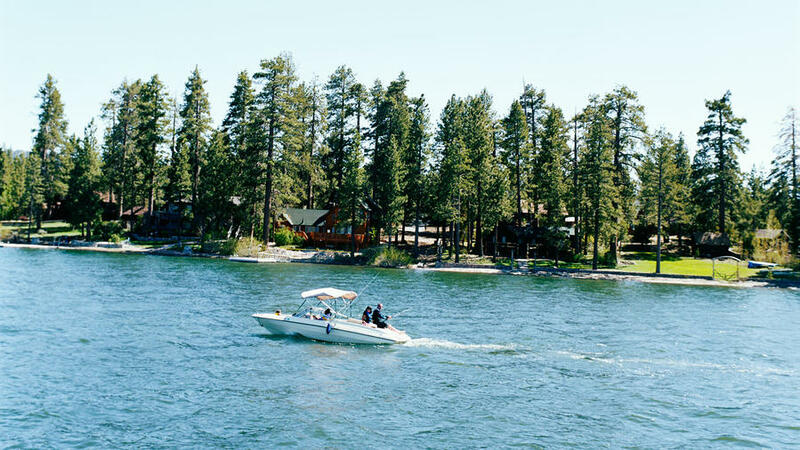 Get your adrenaline pumping at Big Bear Lake by taking the plunge off granite boulders near China Island, or just set up shop in the sand at McDill Swim Beach for a lazy day in the sun. Why go: When summer scorches, the lake calls. Here’s where to swim, fish, eat, drink, hike, bike, and talk like a pirate at Big Bear Lake, California. How to find Big Bear Lake: About 100 miles east of L.A. Elevation with benefits: At 6,750 feet, it’s 15° to 20° cooler than the inland valleys. Hollywood’s backlot: Big Bear has served as the set for hundreds of films. What fish are biting: Trout, bass, and catfish. Get up early: Or expect a line at Grizzly Manor Cafe ($; 41268 Big Bear Blvd. ; 909/866-6226), where the chocolate chip pancakes are bigger than the plates. Kathmandu cravings? Try the momo dumplings at the new Himalayan Restaurant ($; 672 Pine Knot Ave.; 909/866-2907). Afternoon pint: The citrusy Orange Blossom Amber at Big Bear Mountain Brewery ($; 40260 Big Bear Blvd. ; 909/866-2337). Get a map: The Discovery Center (on North Shore Dr.; sbnfa.org or 909/866-3437) has hiking and biking info—and sells the $5/day Adventure Pass needed for trailhead parking. Make it a weekend: If you’re looking for a place to stay at Big Bear Lake, book a cute cabin at Pine Knot Guest Ranch (from $119; 2-night weekend minimum; 800/866-3446). Kids will love the llamas and bunnies; parents will love the in-room Jacuzzis. Almost anywhere at Big Bear Lake is a good place to jump in. For maximum thrills, leap off the granite boulders near China Island—aka Garstin Island (at the lake’s west end; park along State 18). If you’re more into lounging, hang out on the sand with the friendly lifeguards at McDill Swim Beach (12–5; $5; 41218 Park Ave., near Meadow Park; 909/866-9700). Cool down any Southern California summer afternoon by sipping cocktails and noshing on home-made potato chips at B’s Backyard Bar-B-Que on Big Bear Lake. Hit B’s Backyard Bar-B-Que for volleyball on the sand and dogs fetching sticks in the lake. Kick back on the bar deck with $3 mix-your-own Bloody Marys, pulled-pork sandwiches, and molasses baked beans. Warning: The homemade potato chips are addictive. $$; 350 Alden Rd. ; 909/866-5400. The climb up Castle Rock may not be quick — it’s 1.2 miles to the top — but it’s definitely worth it. Trek past the monsterous boulders and giant confiers and you’ll be rewarded with an eagle’s-eye view of Big Bear Lake at the top. Climb the 1.2-mile trail to the top of Castle Rock for a steep tromp with a big payoff: The path heads past giant conifers and car-size boulders to the ridge, where Castle Rock stands sentinel. Scramble to its turretlike summit for an eagle’s-eye view of the lake. The trail starts at State 18, 1.2 miles east of the dam; park in the roadside pullout and display Adventure Pass. In the strollable downtown, you’ll find Copper Q, a new culinary-gadget store with a demo kitchen, cooking classroom, espresso bar, and to-die-for cupcakes. Browse dutch ovens, eco-friendly cutting boards, and Sophie Conran serving pieces. 645 Pine Knot Ave.; 909/878-4777. Rent wheels at Bear Valley Bikes (from $10/hour; 40298 Big Bear Blvd. ; 909/866-8000). If you like to roll on skinny tires, stick to the paved, 2.5-mile Alpine Pedal Path, which hugs the North Shore. The single-track Grout Bay Trail is one of SoCal’s best intermediate mountain bike routes—a 12-mile loop that makes a roller-coaster ascent through the forest. Add on the 2 miles up Gray’s Peak for a peekaboo lake view. Park at Hanna Flat campground and display Adventure Pass. Set sail on the Time Bandit, a 1/3-scale replica of a Spanish pirate ship, to tour Big Bear Lake like a real pioneer — rum drinks and all. Any swashbuckler at heart will love a lake tour aboard the Time Bandit pirate ship (featured in 1981’s Time Bandits), a 1/3-scale replica of a Spanish galleon. Not sure you’ll like all the yo-ho-ho? No worries—the crew serves rum drinks. $19; reservations recommended; at Holloway’s Marina; 909/878-4040.